Cuerden Valley Park Trust in Bamber Bridge is celebrating MWH Mersey Basin Week with a full programme of events. The River Lostock runs through the picturesque park and a group of volunteers are keen to conserve the area for its heritage and importance for wildlife. 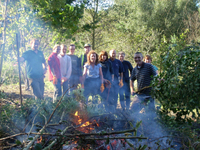 The Sunday volunteers got together on 5 October to improve a pond area that was dug when the nearby M65 motorway was built. The pond has grown bigger than its creators anticipated meaning trees planted at the time are often growing (and rotting) in the water. 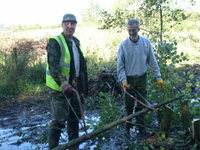 The volunteers felled most of the trees. Some were ring-barked to become standing dead wood and the brash was burned. 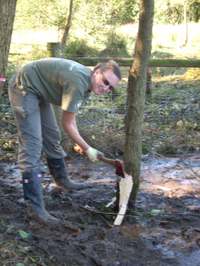 This work opened up the pond and improved the habitat for biodiversity. 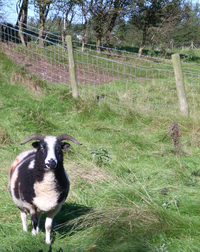 The resident herd of Jacob's sheep will now help to keep the scrub from growing.